Enjoy the characteristic breeding birds of the Pribilof Islands. Excellent studies of all resident birds. We may offer an extended hike over a difficult, ancient lava flow to search for the rare and local McKayʼs Bunting. Get close to a Brown Bear or a bull Moose, and maybe even have the chance to view a wolf at a distance. Our boat (weʼll be the only ones on board today, save for the small crew) is designed for wildlife viewing, with plenty of room both fore and aft for our group. This trip, offers a decent chance for viewing Polar Bear as well as another opportunity to look for such specialties as Yellow-billed Loon, eiders, gulls, Black Guillemot, or something truly unexpected! One's first glimmer of the immensity of Alaska comes as the airplane drops in for a landing at Anchorage. There are towering, snow-capped peaks and icy waters practically beside the runway. And the northern sky is indescribably wide and high, the air crisp and pure. Heading for the hotel, one gets the distinct urge to jump out and start birding immediately as breeding-plumaged Mew Gulls course over ponds beckoningly dotted with phalaropes and waterfowl. Red-necked Grebes? Barrow's Goldeneyes? And those scaup were probably a mix of Lessers and Greaters. A tight flock of crossbill-like birds whizzes over and plummets into the spruces -- probably your lifer White-wingeds. Calming yourself, you realize this is just the beginning of one of the greatest of birding trips, in one of the wildest, most beautiful places on Earth. Birders will have a field day on this wide-ranging Alaskan expedition in search of rare gulls and other birds, from the remote Pribilof Islands to Denali, Nome and Barrow. No reviews yet for this trip. Browse other reviews below for Field Guides . Day 1: Arrival in Anchorage. If we are not ticketing your flight, please be sure to inform our office of your flight number and arrival time into Anchorage. Please take the hotel courtesy van to our nearby hotel (youʼll need to call the hotel after you claim your luggage). We plan to gather in the hotel lobby at 7:00 p.m. for dinner. Night in Anchorage. Day 2: To the Pribilofs. Late this morning weʼll board the PenAir flight to St. Paul on the Pribilof Islands. Lunch (a deli sandwich) will be handed out to each of us before we board the plane. After landing on the island and checking into our rooms at the airport hotel, weʼll spend the remainder of the afternoon and evening enjoying the characteristic breeding birds of the Pribilof Islands. Some of the common birds that weʼll surely see on our first outings include Long-tailed (Oldsquaw) and Harlequin ducks, Rock Sandpiper, Red-necked Phalarope, both species of kittiwakes, Lapland Longspur, Snow Bunting, and Gray-crowned Rosy-Finch (the large island subspecies umbrina). Weʼll also view one of St. Paulʼs numerous Northern Fur Seal rookeries near town. Please be prepared for brisk temperatures (35-45 degrees F) and the possibility of light rain and gusting, cold wind when we arrive on the island. Sturdy, waterproof hiking boots are highly recommended during our entire stay on the island (along with rubber boots or N.E.O.S. carried on the bus for use when needed). Night on St. Paul Island. Day 3: Sun. St. Paul Island. Weʼll have all day today to explore the various seabird rookeries on St. Paul, which will give us a decent chance for clear weather while providing ample time to ensure excellent studies of all resident birds. And with a measure of good luck, we may turn up one or more Asiatic strays (the first half of June is excellent for this). Generally, we will want to spend our morning (after breakfast) in the field, come back to town for lunch, and then head back out for the afternoon. We will also offer an after-dinner excursion for those interested. During our stay, depending on up-to- date reports, we may offer an extended hike over a difficult, ancient lava flow to search for the rare and local McKayʼs Bunting. Nights on St. Paul Island. Afternoon flight to Anchorage. This morning weʼll make one final check of the lagoons and marshes near town for any rarities or migrants that may have blown in during the night. Then weʼll board our flight after lunch to return to the mainland, transferring to our hotel this evening. Night in Anchorage. Day 5: Anchorage to Denali National Park. Weʼll leave our hotel this morning for nearby Westchester Lagoon before driving to Denali National Park to the north. Because we plan to break up our drive with several birding stops and a picnic lunch, it will likely take most of the day. Please be prepared for the eventual rain shower (possible on virtually any day of this tour) and a temperature range of about 45-65 degrees. Night near Denali NP. After breakfast this morning weʼll drive to the Denali Highway southeast of the park. 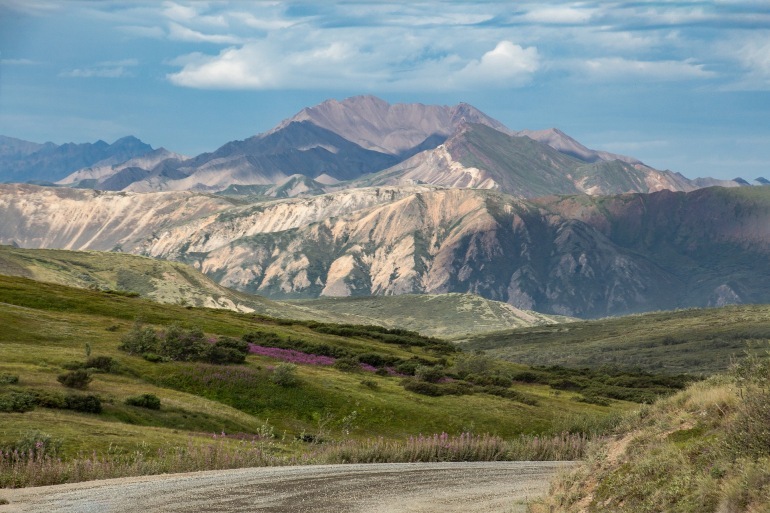 This dirt highway stretches from the town of Cantwell to Paxson, traversing a mixture of willow/birch streamside habitat, Black Spruce bogs, ponds, and a mix of wet and dry tundra situations. With good weather, the scenery and the birding on this road are outstanding. Most of our birding will be along the roadside, but we might make a short hike or two out across wet tundra to look for a target species or two. If we havenʼt come across a Northern Hawk-Owl by now, weʼll be sure to scan the treetops for this elusive bird today. Night near Denali NP. Weʼll be watching today for the likes of Golden Eagle, Willow Ptarmigan, Northern Hawk- and Short-eared owls, Northern Shrike, and White-winged Crossbill. From our vantage on the bus, which will typically stop for just about anything that we wish to view, weʼll be able to sample the spruce woodlands, alpine tundra, and the rocky ridges and escarpments that harbor Rock Ptarmigan, elegant pairs of Long-tailed Jaegers, and perhaps even Gyrfalcons. With luck we could get close to a Brown Bear or a bull Moose, and maybe even have the chance to view a wolf at a distance. Night near Denali NP. Day 9: Flight to Nome or departure for home. Farewell to those tour participants departing for home this morning and welcome to anyone newly arrived for the second part of the tour! For those continuing on, weʼll board our flight to Nome this morning. After checking into the Aurora Inn, our hotel in Nome, weʼll make our way along the coastal road east of town to bird the coastal tundra and the Nome River mouth area near town, as well as the productive Safety Sound area about fifteen to thirty miles out of town for the remainder of the afternoon and into the early evening. Our first afternoon here could produce such quality birds as Bar-tailed Godwit, all three jaegers, Slaty-backed Gull, Aleutian Tern, Eastern Yellow Wagtail, and Hoary Redpoll. Safety Sound is often an extremely bird-rich site and hosts impressive numbers of loons, waterfowl, cranes, shorebirds, gulls, and terns. Most birding will be along the roadside, but we may need to cross some wet tundra or marshy habitat to get a closer look at a suspicious-looking shorebird among the more common species feeding on the mudflats, so rubber boots stored under your vehicle seats might come in handy today. Night in Nome. We plan to spend the entire day in the field today after breakfast near our hotel in town. Weʼll journey some seventy-five miles inland (if the road is open this year) on a good dirt road, preparing a picnic lunch along the way. The bird possibilities today are numerous, and a large percentage of our day will be devoted to the search for the rare Bristle-thighed Curlew, which will entail hiking as many as three miles over the tundra, much of which is uphill and challenging even for those who consider themselves fit. Weʼll take this hike at a reasonable pace, of course, and we hope to encounter the birds early on. Even if the curlews arenʼt in the cards for us today, the likes of Golden Eagle, Gyrfalcon, Tundra Swan, Black Scoter, Harlequin Duck, Willow and Rock ptarmigans, American and Pacific golden-plovers, Wandering Tattler, Gray-cheeked Thrush, Bluethroat, Northern Wheatear, and Arctic Warbler will surely hold our attention! Night in Nome. flight to Anchorage. After a final dayʼs birding around Nome and dinner before we leave town, weʼll fly back to Anchorage on an evening flight. Todayʼs birding will likely take us northwest of town on the road to Teller, where we could find Rough-legged Hawk, Rock Ptarmigan, nesting Black-bellied Plover, Red Knot, Northern Wheatear, White Wagtail, or even a Muskox! Night in Anchorage. Day 12: Anchorage to Seward. Weʼll drive south to Seward this morning after breakfast at our hotel, passing along Turnagain Arm of Cook Inlet and some magnificent scenery en route. Weʼll make several stops for birding and we plan to arrive at our hotel in Seward by late afternoon. The trees are taller and the habitats become generally wetter as we near Seward, reflecting the increase of precipitation in this region of Alaska. A stop along the way this morning at Potter Marsh just south of Anchorage might reward us with a fine variety of nesting waterfowl and displaying shorebirds. Night in Seward. Day 13: Kenai Fjords National Park. Weʼll board our boat to bird Kenai Fjords National Park after a light, early breakfast this morning. The trip is planned to last at least nine hours if the weather is good, four hours if not. Our boat (weʼll be the only ones on board today, save for the small crew) is designed for wildlife viewing, with plenty of room both fore and aft for our group. It is equipped with one to two bathrooms and has an enclosed, heated galley. Most of the waters that we will be visiting are sheltered and are quite calm, but there are a few rougher stretches of open water. If you are prone to motion sickness, you should take the necessary precautions before we board the boat today (or the night before, depending upon the preferred medication). Lunch will be provided on board, and hot and cold drinks will be available in the galley. If you are a photographer, be sure to bring plenty of film (or memory cards). Night in Seward. Day 14: Seward to Anchorage. After morning birding near Seward, weʼll slowly make our way back to Anchorage, making a number of stops along the way to search for anything that we still havenʼt seen (perhaps that elusive Spruce Grouse?). Time permitting, weʼll make a stop at Westchester Lagoon in Anchorage to search for the likes of Red-necked Grebe, Barrowʼs Goldeneye, Hudsonian Godwit, Short-billed Dowitcher, Bonaparteʼs Gull, Alder Flycatcher, or Rusty Blackbird. Night in Anchorage. Day 15: Flight to Barrow. Day 16: Birding the Barrow area. Depending on local road conditions, we plan to visit all of the accessible birding areas near Barrow, returning to town for lunch and dinner. Most of our birding will be from the roadside, but we will almost surely want to venture out into the wet tundra to scan the margins of ponds for the endangered Spectacled or Stellerʼs eiders or to get a closer look at that distant Snowy Owl sitting on a nest. Weʼll also want to arrange for our group to be taken out to the tip of Point Barrow, the northernmost point of land in the US, north of town this afternoon or in the evening after dinner (if the opportunity exists at the time of our visit). Night in Barrow. Day 17: Birding Barrow; flight to Anchorage. All meals from dinner on Day 1 through dinner on Day 17 are included. All flights within Alaska as outlined in this tour itinerary, boat trips, all ground transportation, entrance fees, baggage handling, and the guide services of the tour leader(s). Refund of deposit and payment, less $100 handling fee, will be made if cancellation is received up to 120 days before departure. If cancellation occurs between 119 and 70 days before the departure date, 50% of the tour fee is refundable. Thereafter, all deposits and payments are not refundable. This policy only applies to payments made to Field Guides for tour (and any services included in those fees). Airline tickets not included in the tour fee and purchased separately often carry penalties for cancellation or change, or are sometimes totally non-refundable. Additionally, if you take out trip insurance the cost of the insurance is not refundable so it is best to purchase the policy just prior to making full payment for the tour or at the time you purchase airline tickets,depending upon the airlines restrictions. The right is reserved to cancel any tour prior to departure, in which case full refund will constitute full settlement to the passenger. The right is reserved to substitute in case of emergency another guide for the original one.